This fund, sponsored by the Pacifica Graduate Institute Alumni Association (PGIAA), will provide interest-free loans to CLIE students who are financially struggling to complete their graduate work and who are confronting a financial emergency that requires support. 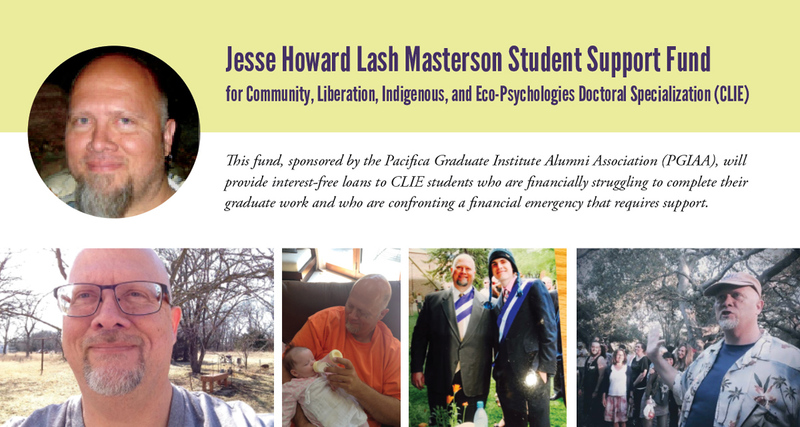 Jesse Howard Lash Masterson, a member of the first Community, Liberation, Indigenous, and Eco-Psychologies doctoral specialization (CLIE) cohort of Pacifica’s M.A./Ph.D. Depth Psychology Program, was a devoted educator committed to multicultural understanding. He brought attention to the impossible choices many graduates students are forced to make between paying for tuition, medical insurance and care, utility bills, and food. He died of pancreatic cancer on 1/7/16 while completing his dissertation on the embodied self in nature. Its long-term viability will be dependent both on contributions and on repayment of funds. When funds are available, students will be notified regarding an application period. A three-person committee of a faculty, an alum, and the director of the Alumni Association will review requests and distribute funds. Donations can be made to the Pacifica Graduate Institute Alumni Association and earmarked for the Jesse Masterson Emergency Fund (249 Lambert Road, Carpinteria, CA 93013). On January 7, 2016, the Community, Liberation, Indigenous, and Eco-Psychologies specialization lost one of the members of its inaugural cohort that first came together in October 2010. Jesse Masterson left this realm shortly after being diagnosed with pancreatic cancer. Jesse had recently returned to his home in Melvern, Kansas to care for his aging parents. He had previously worked at numerous colleges and universities across the U.S.: Emporia State University, University of Arkansas, Ohio University, Rhode Island School of Design, Sam Houston State University, and Naropa University. Jesse held a variety of spiritualities including Buddhism, Wicca, Druidism and Shamanism. He was consistently demonstrating in action and words his deep respect for and connection with other than human beings. He was often seen walking the grounds and communicating with various trees around campus. Jesse participated in the construction of the labyrinth that currently is a part of the Ladera campus. Having done so he leaves a part of himself in that place. As a member of our community and a friend Jesse offered deep listening and caring, as well as vulnerable sharing of himself. He did not shy away from vulnerability in the learning environment. He brought his whole self as consciously embodied human, spiritual practitioner, lover of the world, and scholar, to his learning community and to his academic work. Overall Jesse had a very soothing presence, modeling calmness, patience, and walking through life with kindness and gentleness. On his facebook page he referred to himself as Orchestra Conductor of the Universe. May his conducting now be from a new perspective. Namaste.